Book the best Team Building event ever! 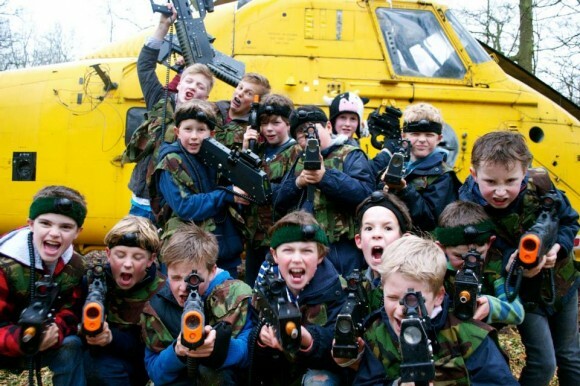 Lasergaming have been hosting premier outdoor team building events in Oxford since 2002, to over 100,000 players. 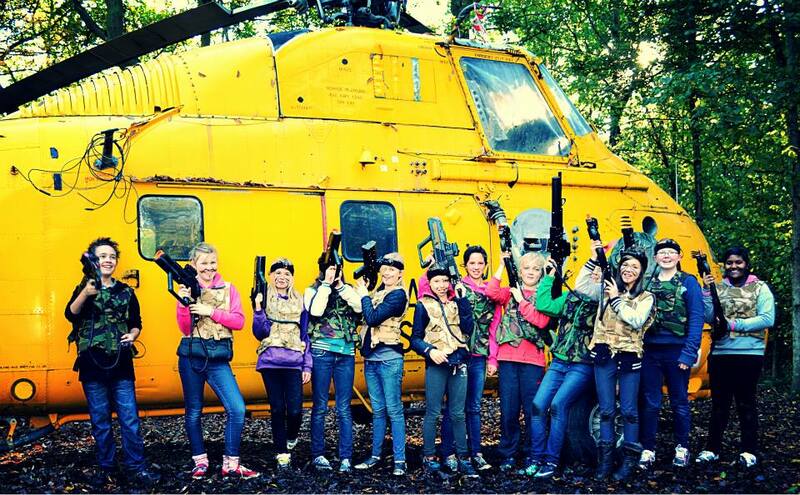 In fact we were the first EVER outdoor laser tag venue in the UK, so we know what makes the best Team Building event on the planet! Our Corporate team building events are Hassle free, we take care of everything and most importantly we make sure your event is a huge success for all the team! Whether you are celebrating a milestone, the teams performance, rewarding the team for a successful year or on-boarding a whole new department that will be working together then our sessions are the perfect event for both the Gents and the Ladies of all ages. With 8 different gaming guns to choose from, there is something for everyone from the small light weight models to the big guns! 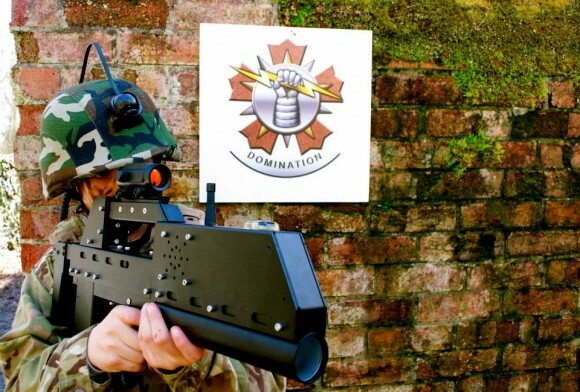 Well we have the solution – Our Lasergaming Corporate events are the ULTIMATE, authentic live combat gaming experiences where the players are part of the scenarios. 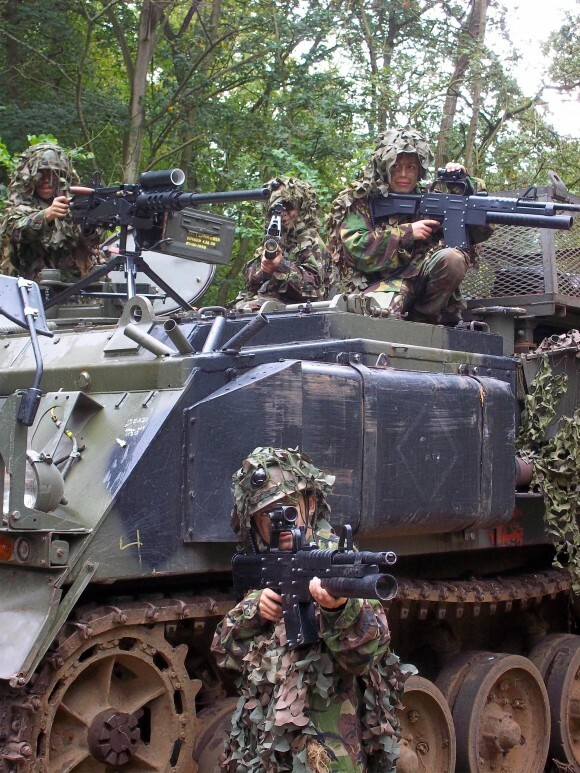 Our Battlefield is purpose built with real life movie props for our team building missions. Each mission has an objective that requires planning, strategy, communication, implementation and debrief. Intel will be given and once the mission is over, the team will need to review the tactics and strategy used before the next mission. 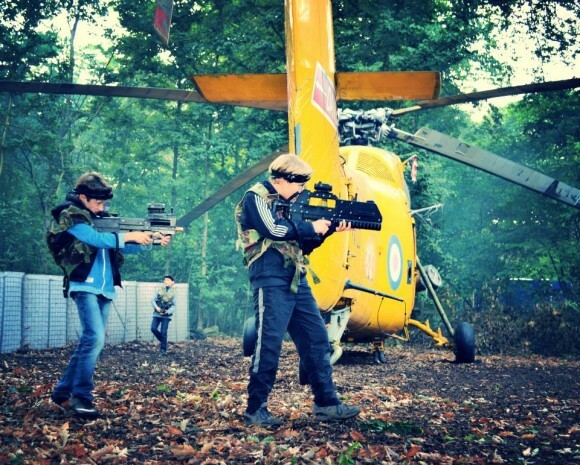 We use the latest sophisticated gaming technology and only the very best Battlefield Sports Laser tag equipment which has been used at the Divergent movie premier in London, Gadget Show Live, Top gear LIVE and is also used in over 350 venues worldwide. We are not indoor laser quest where you run around a dark maze with a phaser pack and shoot each other for 30 minutes, Lasergaming is a team based game and your scored as a team! We are good at what we do and are experienced in making Corporate Events amazing and memorable, no 2 events are the same. We’ve had over 100,000 players play over the years so we are good at what we do! Our focus is on Player experience and making your event the best ever, guests will be talking about your event for weeks. Lasergaming is a TEAM game, not an individual game. We run structured missions where all the team are involved and work together battling against another team. Team strategy and tactics are required. Planning and implementation are required, effective communication and clear vision is required. In game player stats – No Awful HUMILIATION print outs ranking players from good to worst! If your the person organising the corporate team building event then that is something that you want to avoid – no team building in that! With Lasergaming Each player can see their own in game player stats updated in real time on their own gaming gun during the mission games, no more waiting for the end of the party to see how your doing. Our awesome missions are not based on individual scores, your scored as a team so you can see how effective you are working as a team and then work on improving that in the next mission. We have over 1000 different missions to choose from, which means we have a lot of fun on our events, we don’t just stick to the boring preset capture the flag and base assault games, we base our missions and games on the latest most popular games and movies out there and our experienced staff can change up the games and missions, in game, making each team experience awesome! We provide Hassle free, Healthy, outdoor Corporate events for Ladies and Gents of all ages and all physical capabilities, we take care of everything, providing you with Commanding officers to take care of the groups, we run the most up to date missions, can provide food options and can even arrange at an additional cost – personalised dog tags for each player for the medal ceremony. Our sessions are all weather events, so take place in sun, rain and sleet! We are a wet weather provider and work off the motto there is no such thing as bad weather just bad clothing. Teams need to be committed to the missions at all times and the team can not fail because it is raining! We have over 100 gaming guns at Lasergaming which means we can cater for those huge corporate battles so everyone can play at the same time. Evening sessions – Monday – Friday & Weekends after 5pm. Organiser attends free (21st Place) – Minimum charge 20 players, even if you have less. Start times at 5pm, 5.30pm, 6pm, 6.30pm. No Masks, No goggles and better still No Pain! We know how stressful booking a team bulding event can be and we hope to answer all your questions before you book your event with us. Below are a collection of questions other event planners have asked in the hope this can be of help to future parents booking their events with us. On Arrival you will hand in your disclaimer forms to the commanding officer. You will then be briefed on the session ahead and begin kit up and weapon issue. Once you are ready the safety brief will begin and weapons training will commence. We will then give you your first mission and send you on your way. This usually takes approximately 30 minutes in total. Throughout the rest of the session, other mission objectives will be given to you and you will continue to complete the mission objectives and you will continue gaming until the end of your session. If you are booking for the 2 hour option your game time will be 1.5hrs and if you are booking the 2.5hr option then the gaming time will be 2 hrs. The games are pretty full on and immersive so it will be action packed. Absolutely YES! The Ladies LOVE Lasergaming, there is NO paint, NO projectiles, No Pain, NO bruises, NO masks and NO protective clothing needed just to play. 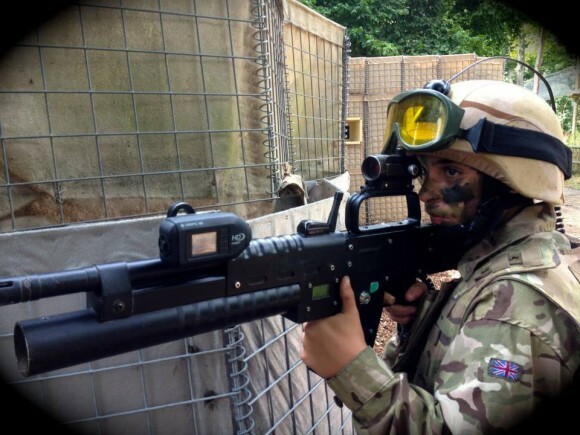 We have 8 different gaming guns to choose from so we have the light weight SMG’s that are only 2kgand we also have the big guns that weight 4kg so something for everyone in team. 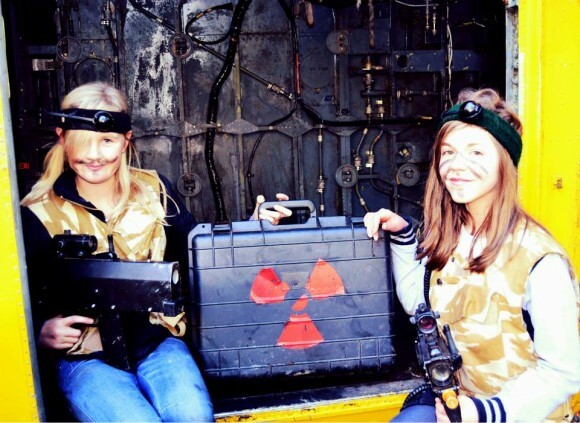 The way our games are structured it isn’t all about who is the fastest and strongest, there are many roles within the team and Ladies LOVE Lasergaming because they feel they can join in the team building fun without being covered in bruises the next day. If your group size is less than 25 players then the session will be non-exclusive so their MAY be others playing against your team, however most corporate groups/other adult groups will want to just book the session for their group only so will likely look an alternative dates if they know someone is already booked on. If there is another adult group in at the same time then your whole group will stay as one and Battle the other group. Other groups will have players that are only over 18 years of age. These might be corporate events, stag or hen events. For our 2hr option, On a weekend (Saturday/Sunday), the minimum number you can book for is 10 players. This is the minimum charge so even if you have 8 players you would still need to book and pay for 10 players for a weekend booking. Does the organiser attend FREE? Yes they do, as a special Thank you for organising your team event we give you your place absolutely free! The free place is in addition to the minimum numbers booked, so if your booking for x 10, you would still pay for x 10 and the 11th place would be free, or if you were booking for x 15 then the 16th place would be free for you. Lasergaming has no projectiles so there is NO paint, NO projectiles, No Pain, NO bruises, NO masks and NO protective clothingneeded just to play. Depending on the time of year you will need to wear appropriate outdoor clothing – there is no such thing as bad weather just bad clothing! For winter months we recommend warm layered clothing, waterproof coat/Jacket, old clothes you don’t mind getting muddy and grubby in the woodland, trainers or walking boots only – no open toed/open heeled shoes. Shoes must have adequate ankle support for outdoor use. Thin gloves, and anything else to keep you warm. In summer months we recommend long trousers (we are a woodland and insects live int he woodland), long sleeved t-shirt, trainers or walking boots only – no open toed/open heeled shoes. Shoes must have adequate ankle support for outdoor use. You may wish to bring a think waterproof coat if raining. We recommend sunscreen and insect repellent. Yes we have plenty of FREE parking and also coach and minibus parking. Players and visitors park at their own risk. Please note Lasergaming UK Ltd does not accept liability for any loss or damage to motor vehicles, their accessories or contents whilst parked in our carpark. Please leave all valuables at home. What is the difference between a corporate session and a pay and play session? A corporate session is specifically tailored and structured to the groups playing and their needs. The missions and the game play will be suitable and selected for the teams playing and will use skills such as team strategy, planning, communication, implementation etc. In the pay and play sessions we have families, kids and mixed adults/kids playing so our missions have to be very generic and suitable for both kids and adults. They are very non-specific and non structured as the session is just for fun and they do not require all the skills above. Players are mixed up in to different teams. Do you need a disclaimer or consent form to play? Yes, all players must have a signed player consent form to play. Under 18’s signed by their parents, over 18’s by themselves. NO FORM – NO PLAY. These should have been issued with the invite for the party. If your guests highlight a medical condition, they must provide details before the day, for example, if they have ticked back injury, they must provide details on the nature of the injury, how long ago etc. 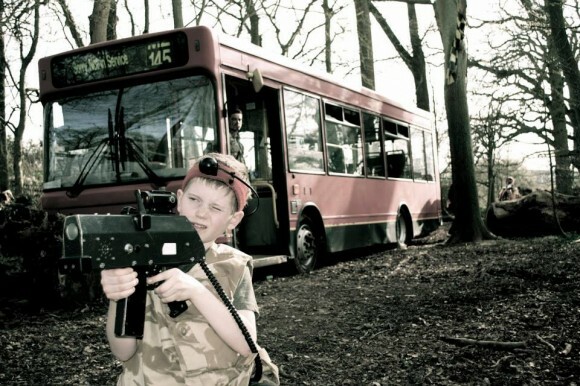 In order to play Lasergaming all players must be able to safely negotiate their way around our woodland and gaming zones and be able to hold their gaming gun unassisted throughout the duration of the gaming. They must be free from serious injury. In the event a medical condition or injury prevents this then we may need to check suitability of the activity. Please call us on 01865 410074 so we can advise on this. With good preparation and management of the session, it is not very often players can not take part, it is better to call us and check beforehand if there is anything you are unsure about so we can make preparations for that particular player, conduct the necessary risk assessments and check suitability in line with our company policies rather than them turn up on the day, and they can not take part due lack of time for preparation for medical conditions and injuries. If a child ticks the Asthma Box, they must have a inhaler with them to take part. We can not allow players to take part without their medication to treat them in the event it is needed. With the great british weather, we are a wet weather activity, we run all year, that’s sun, rain, sleet and snow! 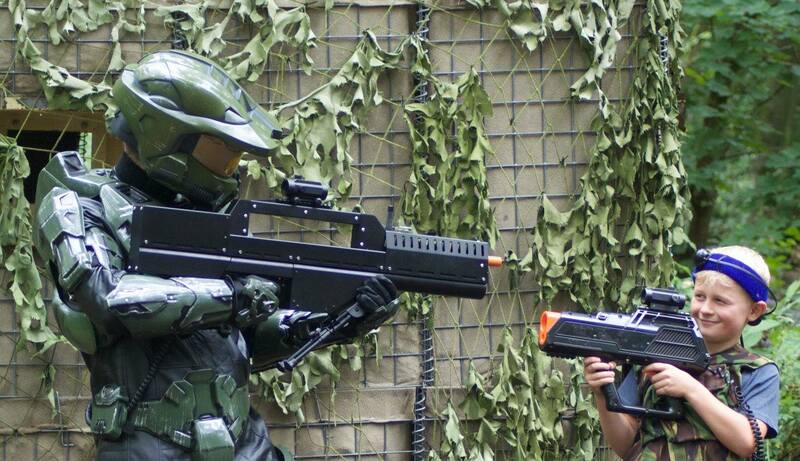 Our gaming guns are weatherproof and so are the staff! We recommend suitable layered clothing for the weather, and suitable footwear. Please see our terms and conditions of booking regarding weather. Our Online booking system allows you to check availability and book online 24 hours a day, making it more convenient to parents. If you would prefer to call us to discuss you requirements please call us on 01865 410074. If you would like to send an email, please email lasergaming@oxfordadventurepark.com. Please note it may not always be possible to answer your call straight away but we aim to call you back the same day during office hours. We are a very busy site, so as per the booking terms and conditions we require 4 weeks notice for a full refund. We recommend booking for the minimum required and then increasing your numbers nearer the time rather than booking high numbers and then cancelling places. Unfortunately we are unable to refund places which are cancelled within 4 weeks of the booking. To stay cost effective to our customers, We also do not provide insurance for late cancellation of places due to illness or refund places for on the day illness’s, please see our full terms and conditions of booking here. On weekends Food is available from the Forest Cafe at an additional cost and can be ordered when booking or pre-ordered prior to your session. From March 2016, players can also purchase wood fired pizza cooked in our authentic italian pizza oven in the woodland at an additional cost. During the week hot and cold food is subject to availability only – please check with us for availability. Looking to run your own event? Then why not trying Lasergaming’s very own Laser Tag Hire service – Laser Tag In A Box!